1. Africa is a country. 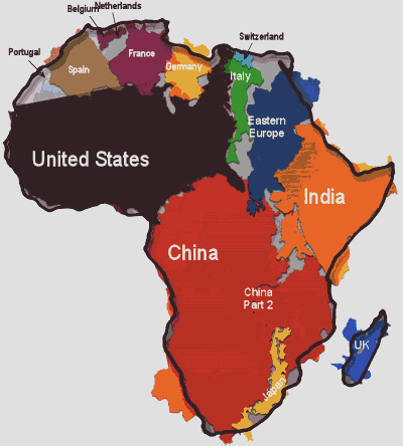 Geography is a lost subject from where I come from, so let me just remind everyone that Africa is a continent. A large continent, in fact, as you can see from the diagram below. Africa is also an incredibly diverse continent, made up of 54 countries. Those countries north of the Sahara tend to be more Arab, those south of the Sahara tend to be more "Bantu" (what you would traditionally picture as African), and those on the Horn (Ethiopia, Somalia, etc) tend to be a fascinating mixture. But even then, I am being incredibly general, as there are thousands of African tribes and ethnicities that are as diverse as as a European would be from an Asian or South American. I am going to debunk the following myths with what I have learned by living in Tanzania, since that is the country I am most familiar with. However, keep in mind that I will be speaking broadly, and knowingly countering the stereotypes about Africa with more stereotypes (albeit, hopefully more accurate stereotypes). In any culture or country, people live along a spectrum, and it's important that we don't ever lump an entire group (or continent) of people under any particular label. My main goal is to use what I have learned in Tanzania to change the mental picture many Westerners have of Africa. 2. Africans are all poor. Yes, poverty is a huge problem in many African countries. (Of the 25 poorest countries in the world, only 4 are not African.) But that doesn't mean there aren't any middle-class or rich people. Even though Tanzania is one of the poorest countries in the world, there are many rich people here. Economic class distinctions are huge, and since the concept of equality is not valued the way it is in the West, rich people are usually treated better and with far more respect and privilege than poor people. 3. Africa is not clean. It's true that public areas in Tanzania are often trash-filled and untended. However, that says more about a lack of infrastructure than the character of your average Tanzanian. Tanzanian homes, vehicles, and businesses tend to be very clean--much cleaner than what I have often seen in America. 4. Africans do not have access to clothes or shoes. Maybe that was true in the past. Maybe it still is true in some war-torn countries. But in Tanzania, it is absolutely not true. Fabric is locally designed and printed and plentiful. Hundreds of tons of cast-offs from American and European thrift stores are shipped over and sold in the local markets. I buy most of our clothes here now. There is no lack of clothing--and therefore, no need for you to send over your shoes or clothing. If you are supporting an organization that needs clothes, send money instead and support the local economy. 5. Africans dress in rags. I have found that Tanzanians dress far more professionally and formally than those from my home state of "casual" California--and this is regardless of their economic status. Women hardly ever wear shorts in public, and you rarely find a woman in the supermarket wearing the equivalent of yoga pants with unkempt hair. Dry cleaners and salons are everywhere and people regularly have their clothes individually tailored. Even those who work manual labor dress professionally for the bus ride and change into work clothes when they arrive at their job. In social situations, I often feel under-dressed. 6. Africans all live in villages. Like most of the world, Tanzania is rapidly becoming urbanized. We live in a fast-growing city of five million people, and it is predicted to reach 20 million in the next 30 years. 7. Village life would be perfect if white people weren't messing it up. So I'm not going to get into the complicated mess of colonialism, but let's just say that yes, I agree that white people have done a lot of messing up in Africa (to put it mildly). But let's not swing in the other direction and assume that village life was or is peaceful and idyllic. Of course, beauty can be found anywhere, but female circumcision, child marriages, polygamy, alcoholism, albino murders, women who walk miles to find water, illiterate children, lack of basic health care and high infant and maternal death rates are not to be sugarcoated by some convoluted notion of the "noble savage." 8. All Africans are black. If all Africans are black, then all Americans are Native American. Colonialism happened on both continents. However, European diseases managed to wipe out most Native American populations, and African diseases managed to wipe out most European settlers....and the rest is history. South Africa probably has the most well-known white population, but I also have white African friends from Zimbabwe, Kenya, and Tanzania, whose families have lived here for generations. There are also hundreds of thousands of Indian (Asian) families who have been East African citizens for over 100 years. An Indian (Hindu) wedding ceremony in Tanzania. 9. Poverty is Africa's biggest problem. Absolutely, poverty is a huge problem. But I am convinced that worldview is a bigger problem, and specifically how that plays out in governmental corruption. Which is why sending "aid" to Africa (in its many forms) is really just sticking band-aids on a cancerous tumor....and why the gospel offers real hope. 10. Africa has been evangelized. Northern Africa? Definitely not. Sub-Saharan Africa? Partially. There are still thousands of villages in Tanzania without a church. There are still dozens of languages in Tanzania that don't have a Bible translation. However, it is true that Christianity has spread like wildfire throughout sub-Saharan Africa in recent decades. Unfortunately, it's often a version of the Prosperity Gospel. Missions has most definitely changed in Africa in recent years. Gone are the days of pith-helmet-clad white men tromping through the jungle to preach the gospel to remote villages. In fact, there are far fewer white missionaries who are engaged in church planting and evangelism. Instead, western missionaries are narrowing their focus to equipping and training Africans to do the job themselves. I don't have statistics, but I'm quite confident there are many more African missionaries in Africa than there are western missionaries. And that's how it should be. Those Kids...Are They American or Not?